As we know the order to build the first tabernacle was given by God to his servant, Moses. Just as God called Moses to lead his children, he remembered and called his servant, Elder Zelte Crawford, to a long faith journey. Pastor Crawford established a work for the Lord in 1957 at Mack and Canton, in Detroit. His first church was a storefront located next to a bar. The late Bishop William Rimson blessed Pastor Crawford and gave him several chairs. The Lord was with Pastor Crawford and it was not long before the patrons of the bar began stopping by the little storefront church. The first family to unite with the church heard the word of God being preached one night as they were on their way to the bar. After several months of searching, the Lord directed Pastor Crawford to 2600 Crane Street in September, 1958. The cost and size of this facilty were exactly right for the growing congregation. The Lord continued to bless and add to the church. The Lord blessed the congregation, both spiritually and naturally. After 14 years at the Crane Street location, the Lord spoke the word "move" again. This time, the church moved to 10510 Sterritt Street. After 10 years at the Sterritt Street address, God blessed the congregation and they were able to burn the mortgage. In November 1994, God's Holy Tabernacle Church moved to a temporary location on Plymouth Road. There were some dark days on Plymouth Road, but Pastor Crawford held the congregation together. Souls were added to the church and the Lord continued to bless the saints. In early 1995, God's Holy Tabernacle Church acquired and moved to the present property at 4366 W. Davison Avenue. 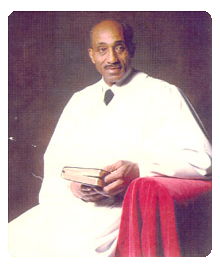 Pastor Crawford served faithfully until the Lord called him from labor to reward in July of 2000.